(RxWiki News) As you prepare for summer and all the activities that come with it, it's important to know the potential dangers associated with grilling. Did you know July is the peak month for grill fires? According to National Fire Protection Association estimates, half of the injuries tied to grills involve thermal burns. To avoid these burns and other risks, check out the tips below. Place the grill well away from the home. Make sure it's placed away from deck railings, eaves and overhanging branches. Do not leave the grill unattended. Keep your grill clean by removing grease and fat buildup. As you clean your grill, however, keep in mind that a 2016 report found that thousands of injuries each year are tied to wire-bristle grill brushes. The reason behind the injuries associated with wire-bristle brushes? When cleaning the grill, loose bristles can fall off of the brush and end up in the food. If ingested, these bristles can cause harm to the oral cavity, throat and tonsils, as well as lead to damage of the esophagus, stomach or intestines if they bypass the oral cavity. If you're using a propane grill, be sure to check the gas (propane) tank hose for potential gas leaks. You can determine if there is a gas leak in two ways. First, use a brush or spray bottle to apply a light soap-and-water solution to the hose. Turn the propane tank on. The propane will release bubbles around the hose if there is a gas leak. If there are no bubbles, then the grill is likely safe to use. If there are bubbles, turn off the tank and check the connections. You can also check for a gas leak by looking for the smell of gas. If you identify a gas leak that stops, the National Fire Protection Association recommends getting the grill serviced by a professional before using it again. If the leak does not stop, the National Fire Protection Association recommends calling the fire department immediately. 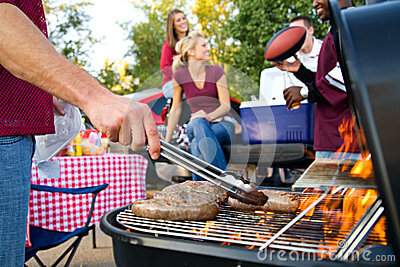 If you smell gas while cooking, immediately move away from the grill and call the fire department. If you will use a starter fluid, only use only charcoal starter fluid. Do not add charcoal fluid or any other flammable liquids to a fire that is already going. When you are finished using the grill, let the coals completely cool before you discard them. Discard used coals in a metal container. Be sure to keep charcoal starter fluid out of the reach of children.